"Few possessors of the Koh-i-Noor have led happy lives, and while Ahmad Shah rarely lost a battle, he was eventually defeated by a foe more intractable than any army. From early on in his reign, his face began to be eaten away by what the Afghan sources call a ‘gangrenous ulcer’, possibly leprosy, syphilis or some form of tumour. 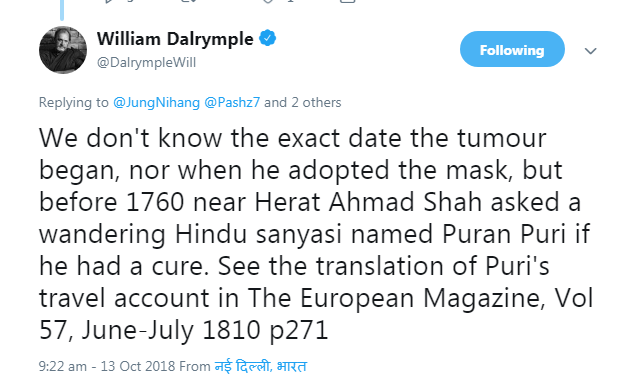 Even as he was winning his greatest victory at Panipat, Ahmad Shah’s disease had already consumed his nose, and a diamond-studded substitute was attached in its place". ["Koh-I-Noor: The History of the World's Most Infamous Diamond ", p-67] . 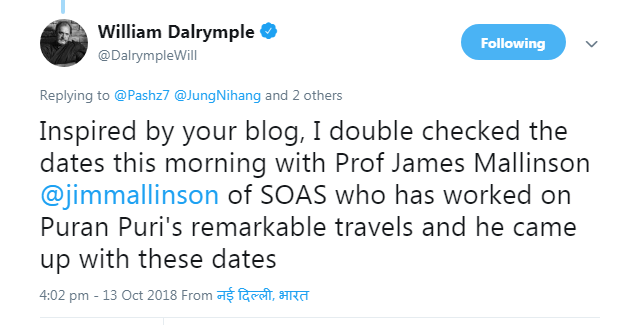 Its interesting to note that William Dalrymple has shared two paintings of Ahmad Shah Abdali in his book (circa 1755) which does not show him with any indication of destruction of his face by disease. All the sources say that Ahmad Shah suffered from tumor in the last years of his reign, just few years before his death in 1773. 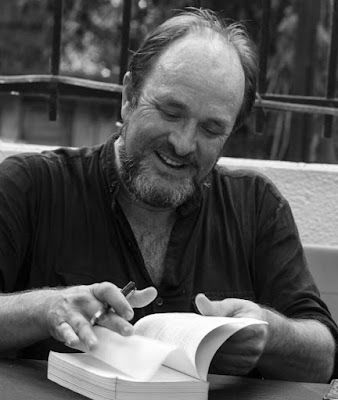 He may have worn face mask at the advanced state of his tumor but William Dalrymple is claiming that he contracted disease "early on in his reign" (circa 1747-1755). 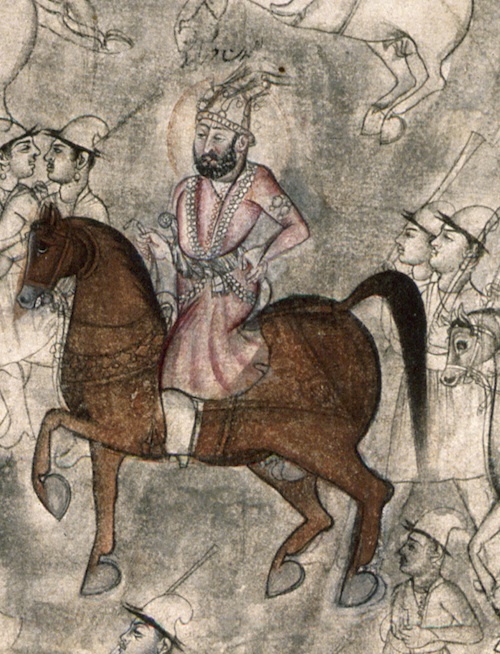 The claim that Abdali's face was suppurating, hidden behind a silver mask, on the occasion of the battle of Panipat in 1761 , is very ridiculous as we have actually eyewitness accounts of that battle (Jafar Shamlu and Kashi Raj) and none reports Abdali in that condition with rotting face and missing nose hidden behind a silver mask. Sir Jadunath Sarkar is talking about marriage of Ahmad Shah Abdali to Mughal princess Hazrat Mahal in 1756. 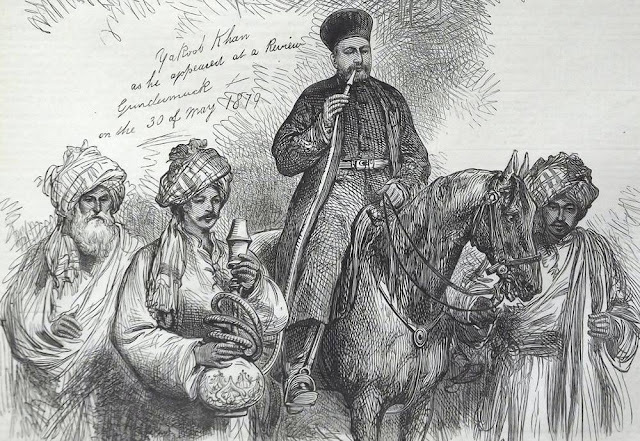 He calls Abdali a man of grandfatherly age even though he was just 33 years in 1756 and makes a baseless claim that Abdali's face was rotting in that year. 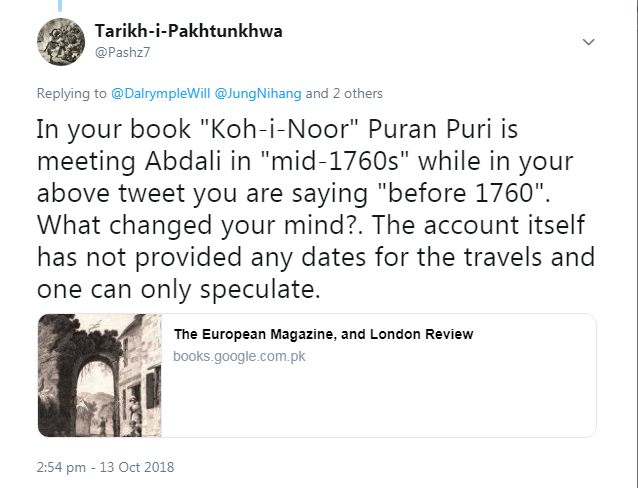 Note that dates in Purn Puri account does not give dates and one can only speculate about the year in which he met with Ahmad Shah Abdali. 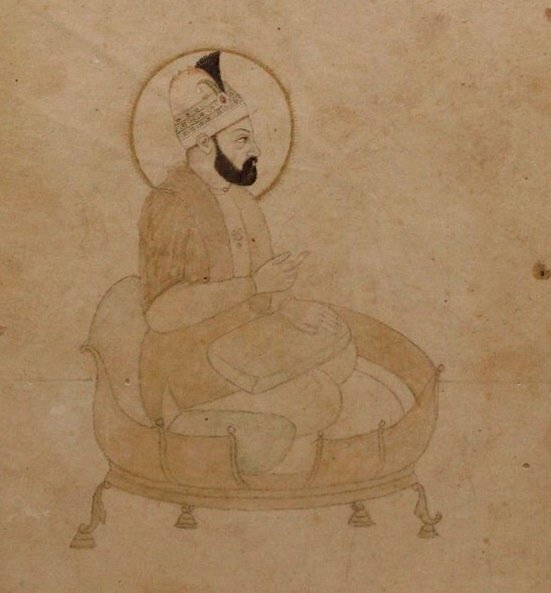 Portrait of Ahmad Shah Abdali placed in Lahore Museum, circa 1755.